Recently I began covering one of the best open source video editors available (see my articles “Create videos with OpenShot Video Editor” and “Add transitions with OpenShot Video Editor“.) From those two articles (and an ounce of creativity) you should already be creating outstanding videos for various purposes. But now it’s time we take it yet one step further and add titles to the videos you have created. The OpenShot Video Editor has a built-in tool for the creation of titles. 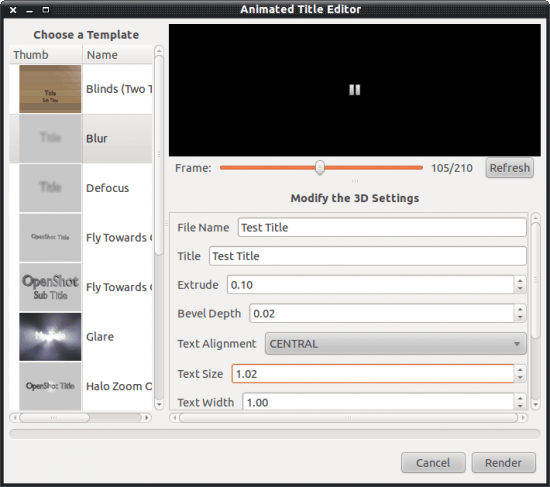 With this built in tool you can create static or animated titles. Now, the title editor relies heavily on Blender >= 2.5, so you will need to have this vector graphics tool installed as well. NOTE: If you are using Ubuntu 10.10 the installation of Blender does not meet the requirements (it is 2.4x and not 2.5). For this to work you will need to install Blender from source. Once you have Blender installed all you have to do is find out what directory has the Blender executable (open up a terminal window and issue the commandÂ which blender to find this out). Once you have that path, click Edit > Preferences and then enter the full path to the executable in the Blender section. You should also know there are issues with older releases of the Blender/OpenShot combination on Ubuntu causing titles that are CENTERED to not work. Hopefully this bug will be worked out soon. You can begin creating your titles even before you have created your video. All you have to do is open up OpenShot and click Title > New Animated Title to begin creating your title. Of course you do not have to create an animated title. You can easily create a static title for your video and then spice it up with transitions and/or fades. File Name: This is the file name for the resulting title file. Title: This is the text for the title. The rest of the configurations can all work with the defaults. If your installation has trouble working with CENTRAL (AKA CENTERED) just select a different alignment for your title text. When you’ve configured your title click the Render button. As you might expect, the very term “Render” could bring your PC into the realm of slow motion. Even rendering a short title can bog your machine down…so don’t do any crucial work during the rendering process. After the rendering is finished you will then have a fancy new title clip to add to your video project. To add the title all you do is click File > Import Files, navigate to where you saved the title, and add it. Naturally you will want to add the right title to the right location (as in Intro titles to the beginning and Credit titles at the end). OpenShot is an amazing tool for creating video projects for various purposes. The ability to create static or animated titles only heightens the level of professionalism to your video.